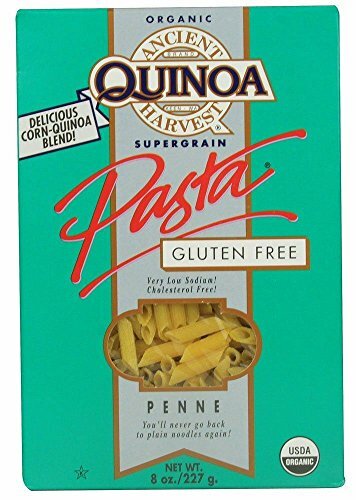 Ancient Harvest Quinoa Organic Penne Pasta, 8 Ounce -- 12 per case. Our pastas combine the rich nutty flavor of Ancient Harvest Organic Quinoa flour with a natural blend of corn flours to produce the highest rated line of non wheat pastas available! Ancient Harvest Organic Quinoa Penne contains more protein than comparable pastas available. Because of quinoas high quality protein balance, which includes all ten essential amino acids, you can be assured of pasta that is superior in nutritional value. Our pastas are rich in niacin, thiamine, iron, phosphorus and zinc. They are low in fat, sodium and contain no cholesterol, dairy, eggs or preservatives. Ancient Harvest Organic Pastas are fully cooked in just a few minutes, and is delicious when used in both hot and cold dishes! Perfect for both gluten free and vegan diets, this pasta is sure to satisfy every need! Certified Organic by Quality Assurance International and USDA. Certified Kosher and produced in a gluten free facility. Product of U.S.A. If you have any questions about this product by Ancient Harvest Quinoa, contact us by completing and submitting the form below. If you are looking for a specif part number, please include it with your message. Bionaturae Organic Gluten-Free Italian Pasta 3 Shape Variety Bundle: (1) Elbows, (1) Fusilli, and (1) Penne Rigate, 12 Oz. Ea.